My second NBinSFF podcast is live. “D.B. 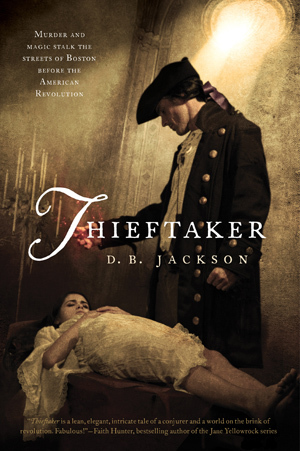 Jackson” is David B. Coe’s pen name for his new historical-fantasy series, The Thieftaker Chronicles. Thieftaker (Tor Books, 2012) centers on Ethan Kaille, a private detective and conjurer, as he investigates a murder in colonial Boston. David, who received a Ph.D. in U.S. history from Stanford University before embarking on a career as a novelist, weaves in plenty of period details and historical personages into an alternate Boston where conjuration is real, albeit suppressed by the authorities. David maintains a page of resources for those interested in his well-researched setting. He also is a co-founder of, and co-writer for, a blogdedicated to assisting aspiring speculative-fiction and fantasy authors with all aspects of the craft. You can read the rest the rest and listen to the podcast at the New Books Network.